To the west of Tampa in Hillsborough County lies one of the best destinations for motorcycle riders - Plant City, Florida. Located almost halfway between Brandon and Lakeland on Interstate 4, Plant City has long been a part of the itinerary for Florida motorcycle riders planning rides along Florida’s Sun Coast. Interstate 4 dissects Plant City in the north, from exits 17 to 25. Motorcycle riders can make their way straight through the heart of Plant City on the scenic U.S. Route 92, which runs almost parallel to Interstate 4. At its center, Florida State Road 39 intersects with U.S. Route 92 in Plant City, leading north to Zephyrhills and south to Hopewell, creating many options for motorcycle riders starting from or riding through the city. While Plant City is well-known for its scenic southern flatwoods, replete with luscious pines and other evergreens, the city itself is not actually named for its ecosystem, but for entrepreneur and railroad man Henry B. Plant. True to its namesake, motorcycle riders will surely enjoy the many scenic railroads as well as the lush woods surrounding and running through Plant City. Bikers will surely be interested in attending one of Plant City’s several bike fests throughout the year, as well as the Florida Strawberry Festival, which has earned Plant City the title of ‘winter strawberry capital of the world,’ as well as its two wildlife preserves, historic downtown, and cutting edge brewing scene. But for every trip a rider takes, there is always the chance of motorcycle injury. Interstate 4 is famous for its congestion and can be a motorcycle accident injury waiting to happen. Railroad crossings can be tricky to navigate, festivals can be hectic, and no one can predict when other drivers might just have a few too many. Just as you prepare a ride, be prepared in case something goes wrong. Know which motorcycle injury attorney you’re going to call if something happens. Prevention is key, but we can’t control all factors: in case of injury on a motorcycle, call Brad Souders, the motorcycle injury attorney. Clearwater born and raised, Brad is a member of both the Brandon Old Town Chapter and the Polk County Harley Owner Group. He knows his way around a motorcycle and he knows his way around a motorcycle injury case. No one is more familiar with Florida motorcycle riding and Florida motorcycle injuries. For the past 25 years, Brad has earned his reputation as an attorney for bikers – a Biker Representing Bikers - because he is both, he is a life-long biker and is an award winning trial lawyer committed to representing his fellow bikers in the court of law when the unexpected happens. Don’t be fooled by other attorneys – if they don’t know motorcycles, they don’t know how to represent you. 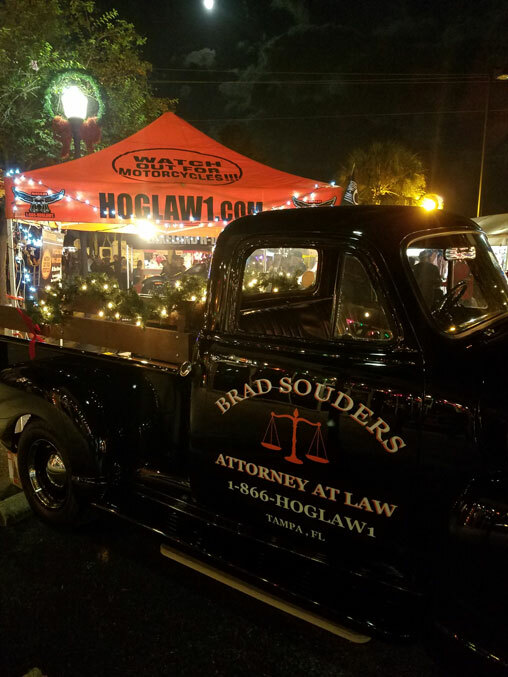 If you’re involved in a motorcycle accident in Plant City, call Brad today for the representation and justice you deserve! You need an experienced Plant City Motorcycle Accident Lawyer.